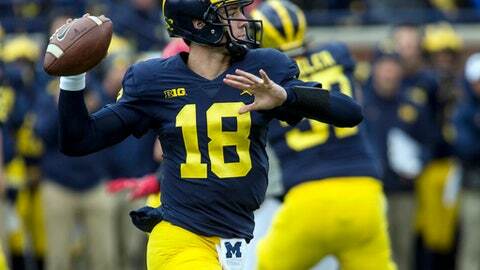 ANN ARBOR, Mich. (AP) Quarterback Brandon Peters flourished in his first extended chance to play for Michigan. It might have earned him another chance to show what he can do. Coach Jim Harbaugh on Monday said he was not naming a starter for this weekend’s game against Minnesota. Still, after Peters led the Wolverines to a 35-14 win over Rutgers, Harbaugh had seemed to back Peters and he was reminded of that. Harbaugh said there’s a ”51 percent,” chance Peters will make his first start for the Wolverines (6-2, 3-2 Big Ten) against the Golden Gophers (4-4, 1-4) on Saturday night. And perhaps to keep the opponent guessing, Harbaugh said both the redshirt freshman and fifth-year senior John O’Korn would be prepared to play. Peters replaced O’Korn against the Scarlet Knights and made the most of the chance. He was 10 of 14, completing passes to nine teammates, for 128 yards and a touchdown in his first extended opportunity in a game. Peters’ command in the huddle and at the line of scrimmage needed work. That sounds as if that’s one of the reasons he didn’t play sooner instead of O’Korn, who replaced injured starter Wilton Speight last month. ”When he first got here, we could barely hear his cadence,” senior center Patrick Kugler recalled. Peters acknowledged projecting his voice was previously a problem. ”The biggest step I’ve made is my communication,” he said Saturday. The Wolverines could hear him loud and clear between snaps against Rutgers, and they saw a maturing player proving he was ready to play. ”He was very calm and collected,” Kugler said. O’Korn, in his fourth straight start, has not appeared to be at ease as a starter. He was 3 of 6 for 13 yards with an interception and recovered two of his own fumbles off snaps against the Scarlet Knights. He played well in relief of Speight (cracked vertebra) against the Boilermakers before regressing. He was 18 of 26 for 270 yards and a TD in a win over Purdue. O’Korn had three interceptions in the following game, a loss to Michigan State. He had just 58 yards passing while being pushed to overtime in a win at Indiana. And at Penn State, he threw for 166 yards without a TD. With Peters playing, the Wolverines suddenly had a passing game to complement its run-by-committee attack. ”It changes the whole offense when you have the ability to do both,” Kugler said. ”Brandon came in and did a phenomenal job. He’s not playing quiet anymore. He’s confident in his play and you need that in a quarterback.